Re-connecting Robin Hood Gardens proposes a reappropriation of Alison and Peter Smithson’s ‘streets in the air’ idea into the current context of the site, elaborating clusters of street-twigs that programmatically overlaps house, street, district and the city. It represents an effort in establishing connections and spatial engagement through the introduction of a new programme; an architectural archive. A mix of activity is therefore developed between the public and private realm of the residential and the institutional, framing a socially-engaging urban network. Alison and Peter Smithsons’ vision for an ideal city combined different activities within the same areas and they envisaged modern housing being built as ‘streets in the sky’ to encourage the residents to feel a sense of “belonging” and “neighbourliness”. They believed that the traditional ideals of the Modern movement in regards to the issue of urban residential planning to be no longer relevant, and considers it to be ineffective in creating a socially-engaging network. The design for the Robin Hood Gardens in 1972 represents the only built project theorized by their social housing and urban city ideals. In the original design for the Robin Hood Gardens, the urban gesture of connections however, is lost through its plan and circulation in relation to its immediate context. The ‘streets’ are simply put up in the sky and not elaborated into the urban fabric. Streets are suppose to connect places; the streets of the original Robin Hood Gardens, doesn’t. 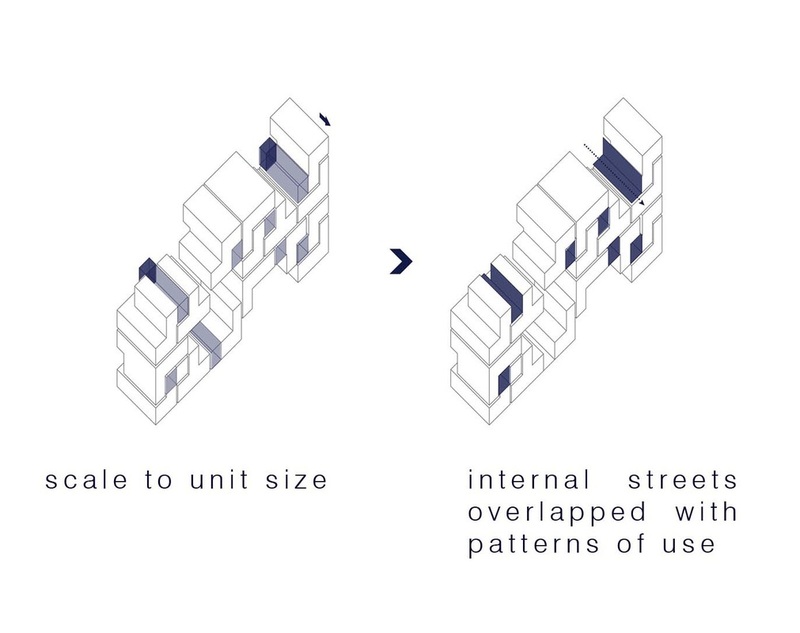 The intention is therefore to reconnect programmatic and spatial circulations, overlapping clusters of street nodes by increasing permeability through the site and its builtforms. and Community Centre, as well as the Woolmore Primary School is remotivated in its connections, allowing community programmes to flood from its location into the site. The cluster of urban network then dictates the alteration, redefining existing relationships of the builtform. 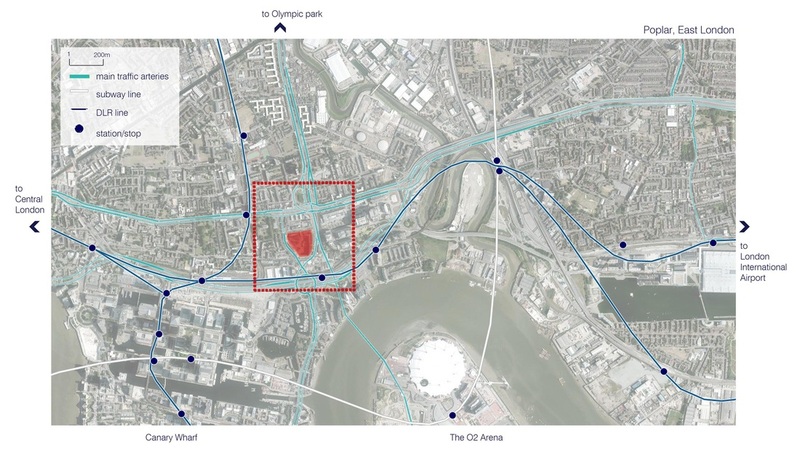 Programmes and events overlap in what is to be a community hub of sorts, a mix of activity that features the public institution of an architectural archive, and the allocation of social housing units in a mutually- supporting urban framework. The re-purposing of a 1970’s social housing block to become an institutional building which houses the body of work of the Smithsons is then negotiated with its new exterior relations. A volumetric re-shuffle is done to increase spatial variation and create spaces which would allow the appropriate scale and dimensions to house the display and collection of the works. Circulation within and connecting the blocks are reorganized, allowing for a more seamless movement from space to space. Voids as solid relief at ground floor replaces the original vertical circulation cores, to promote better access and connection into the site. This approach to increase permeability and access represent issues which were severely limited in its original residential framework. The building to ground relationship is therefore treated as civic hinges, with the architectural interventions framing the spectrum of events and activity that occurs. 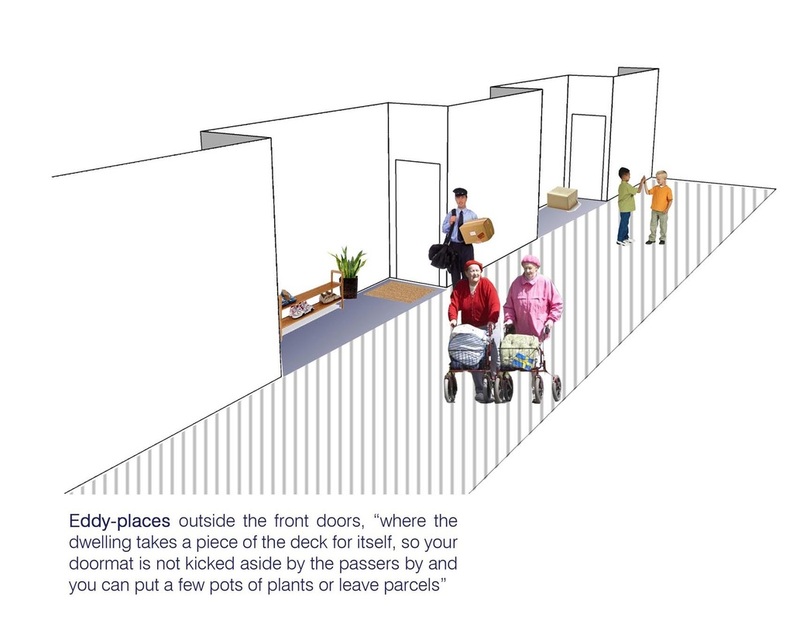 In the original design, the eddy places outside the front doors of each unit represent a space where dwelling takes a piece of the ‘street’ itself, wide enough for two woman with prams to stop and talk without blocking the flow of traffic and still let the postman by. This notion is remotivated in the social housing block, to allow for better user circulation and collective spaces between residents that is driven by the patterns of use in the community. Self-organizing patterns of use dictate the provision of the collective spaces. These spaces will initially act as common property with access and usage provided to neighbourhood owners. Upon provision property owners have the jurisdiction to treat it as a physical extension to their growing family’s unit, a shared space agreed upon between two owners, or as a commercial lot rented to a proper tenant. This approach bridges the private and public realm of the scheme, an extension of each unit’s doorstep in engaging the residential part of the scheme in its relation to the masterplan as a whole. The scales of relationship in this scheme works across what was the large open greenspaces, to the smaller interventions which accentuates and delineates the architectural alteration. By carefully carving out spaces and setting up boundaries, the open space in the middle now begins to suggest public access and activity, instead of what was a mere open field with mounds which provoke inhabitation and poor social activity. Spaces such as allotments allows the residents to relate as a community, whilst the open field and children play areas are devised to become a catalyst of sorts to engage the adjacencies around the site. The design is programmatically multi-faceted in a way that it inherently represents an overlapping of programmes, utilized by different sets of people. It incorporates the activities of public who visit the archive, the residents in their social relations, as well as the children of the school and neighbourhood, through the open play spaces. In addition to the main function of the archive block as galleries for display and workshops for research, a library is introduced. This relates to the many written works of the Smithsons, which their theories must be read alongside understanding the visual components of each of their projects, both built and unbuilt. This promotes social sustainability that will ensure a longevity in the builtforms and provisions, and allow for a healthy growth of the community. A precedent in the form of Carlo Scarpa’s restoration of the Castelvecchio was looked at as a study in treatment to what is original and new in the building. A layering of textures and materials is adapted through this, by carving out spaces and peeling off certain walls and slabs to reveal the original structure. This is then overlayed with new materials which accentuates and creates a tension of sorts in the junction of spaces, framing a relationship between the old and the new.